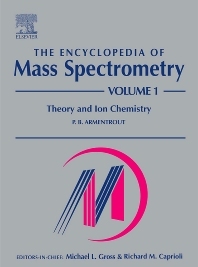 Theory and Ion Chemistry concentrates on the fundamental aspects of a set of 13 carefully chosen topics covering the whole field of mass spectrometry. It covers both primary (basic) considerations, as well as advanced topics, the former aimed at newcomers to the field, the latter at the experienced practitioner who may not necessarily be an expert in the particular area. Article references will cover three areas: 1) original or pioneering work in the area 2) seminal contributions to the area, including examples illustrating a given application and 3) useful review articles. Advanced Research Scientists; Mass Spectrometrists; Spectroscopists; Analytical Chemists; and those working in these fields.